Who doesn't love chocolate? It's something I thought I'd have to miss out on when I transitioned to this plant-based lifestyle but oh how wrong I was. Yes, ditching the shop-bought refined chocolate bars is beneficial for a healthy, happy body & mind but that doesn't mean you can't still enjoy all kinds of delicious chocolatey treats - all you have to do is replace cocoa powder with raw cacao powder and voila....healthy chocolate! Raw cacao tastes the exact same as cocoa powder, actually that's a lie...it tastes even better; richer, smoother and more indulgent, but the big difference is raw cacao powder is actually good for you! Cocoa powder is very refined; it's been through a long process and roasted at high temperatures which removes the goodness and a lot of the cocoa powders available in the shops contain added sugars, milk or fats. Cacao, however, is the raw powder that comes from cold-pressed unroasted cocoa beans; this process keeps all the living enzymes intact and it's thought to be the highest source of antioxidants of any food in the world (20 times more powerful than blueberries! ), as well as the highest source of magnesium. Raw cacao comes in a variety of different forms, there's the standard powder which is made by grounding down raw cacao beans, the cacao nibs which are simply pure cacao beans peeled and chopped up and cacao butter which is the fattiest part of the crop and makes up the outer lining of the cacao bean, it's white in colour with a buttery texture and is ideal for making homemade chocolate. I tend to use cacao powder the most as it's so easy to incorporate into chocolatey recipes, perfect for making chocolate smoothies, great for healthy hot chocolate and works well if you want to come your own chocolate.....you can even add it to porridge for chocolate oats, such a dreamy breakfast! So, we've established raw cacao is way better for you than standard cocoa powder but what exactly makes it a superfood? What are it's benefits? Why should we be eating it? Raw cacao isn't just a bit good for you, it's actually bursting with the most amazing nutrients and powerful antioxidants which is why many people say chocolate is good for you (really it's just cacao!). Not only is it packed full of nutrients but it can boost your mood and even prevent ageing! I feel like magnesium isn't a mineral that's talked about too much, but it's so important and many of us don't get enough in our everyday diets. Magnesium is essential for energy production, a healthy brain, a strong nervous system, it's vital for strong bones and teeth and supports healthy blood pressure. 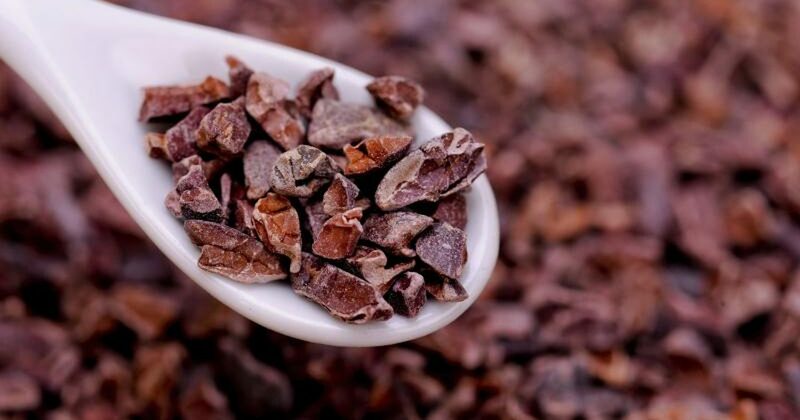 Raw cacao is one of the highest sources of magnesium in the world! Cacao is a good source of iron, which is such an essential mineral in the body. Iron helps your red blood cells carry oxygen from your lungs to the rest of your body, and if you don't have enough of it your body can't make enough healthy oxygen-carrying red blood cells - not good news! Antioxidants are a big 'it' word in the health community and not without good reason. Antioxidants slow down or prevent damage done to cells in your body, so they're like your body's first line of defence and without them your body could suffer. Antioxidants can also help repair cell damage caused by free radicals! Raw cacao is the most antioxidant-rich food in the world and can help improve circulation, lower blood pressure, prevent ageing and even guard us against diseases like cancer. It's a common-known thing that people crave chocolate then they're feeling sad, and there is a reason for this. Raw cacao actually promotes the release of neurotransmitters such as endorphins and serotonin which are real feel-good hormones, making it amazing for people who suffer with anxiety and/or depression. Cacao also contains the mood improver anandamide also known as the 'bliss molecule' which creates a feeling of euphoria. As I said above, cacao boosts levels of serotonin which is the feel good brain chemical. When women are experiencing PMS serotonin levels drop dramatically, so consuming some delicious cacao will help elevate the important hormone out again which will help you feel calmer and promote feelings of well-being. Aduna are one of my favourite superfood brands, and you can pick up some delicious & nutritious cacao from there here.